Discussion in 'The Backstage' started by Biddlin, Apr 15, 2019. Very cool old building, too bad. Thumpalumpacus and Biddlin like this. I've been there before, I thought the whole thing was made out of stone mostly? Too bad, it was a beautiful building. This is utter tragedy for the world - not just Paris. We can't afford to lose such beauty. Thumpalumpacus, papagayo and Biddlin like this. Indeed, rather like New York without the Statue of Liberty or Agra without the Taj Mahal. We can't afford to lose such beauty. "Therefore, do not ask for whom the bell tolls; it tolls for thee." No matter your nationality, no matter your faith or lack thereof, this is a loss for all humanity. It's irreplaceable. It will be rebuilt though but never the same. I'm with Thump here the loss of so much beauty is a loss for humanity. Having been in it twice, it is much more than the stonework. Inside was packed with amazing wooden furnishings and adornments intricately carved with bibilican scenes. The giant rose windows are likely gone too. The 13th century pipe organ, etc etc. Just amazing to look at. They can rebuild it certainly. Many cities in Germany, for example, were razed in WW2 and rebuilt to look as they did prior. As a tourist I had no idea that the 14th century church I was looking at was only 70 years old until I saw a postcard that showed the whole area in 1945 and you could see that basically that church was just rubble. Yes, they can do a great job recreating the building as it looked before. But those contents, that artwork, once that's gone it's gone. This is an example of what I was referring to above. This is the Frauenkirche in Dresden, Germany. It's an amazing looking building today but look at it as it was from the 40s until they rebuilt it. Notre Dame can absolutely be rebuilt and I expect it will be. The historic artifacts within though, if destroyed, are simply lost. Very sad, but it will be restored. This whole thing reminded me of an article I read last year (I found it just now thanks to sharing in on my Facebook), that talks about different philosophical approach to the concept of originality between western and eastern cultures. "...the copy is more original than the original, or the copy is closer to the original than the original, for the older the building becomes, the further it is from its original state. A reproduction would restore it, as it were, to its ‘original state’..."
Interesting. This article raises some of the ideas the ancient Greeks wrestled with in their famous "Ship of Theseus" conjectures on the very nature of identity. In ancient Greece the hero Theseus (guy who founded Athens and killed the Minotaur) returned to Athens and they decided to preserve his ship forever. For centuries they preserved it, replacing planks that rotted with new ones fitted into their old place. At some point there were no original parts left on the ship and the philosophers of Athens (of which there were many!) began to debate whether it was really the same ship at all or an entirely new one. This boils down to a debate on the nature of identity itself. The philosophers would wonder "well if we say it's still the same even with replaced parts, what if the craftsmen who did the replacing changed them in some way? And over time, gradually, the entire ship came to take a different form altogether? No original parts and looking different, can we still say it's the same ship?" Each person will have their own answer to whether it's "real" or not. I reckon that for me the building can be rebuilt and I'll consider that real enough but the artwork made by masters dead for centuries can only be recreated as copies and will never be "real". 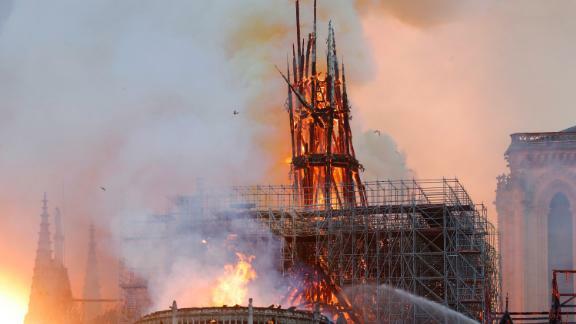 This is pretty arbitrary, I admit, because if there is any fusion between art and architecture, it's Notre Dame Cathedral. The masons were artists in their own rights, and so why do I consider replicating their work somehow more authentic than replacing a wood carving? I don't know either. Weird. Bringing this to the topic of guitars, a vintage guitar loses value in people's eyes whenever an original component is replaced. It doesn't matter if the new part is demonstrably superior, that value is gone the minute you swap an old part with a new one. So in that community, original condition is essential. However you can put in parts from other guitars (as long as they are from that period and correct for the guitar) and nobody minds. So it doesn't have to be part-for-part original to be considered 100% original condition and keep that value. So the right answer to the Ship of Theseus question is "it depends"
PixMix and SG standard like this. Scaffolding and major artworks are a poor mix, so hopefully most of the best movable stuff will have been taken away to storage before the major renovation started. Whatever, now is the time for the world's best craftsmen to get their visas in order, because it is certain that this will be rebuilt. There's at least a ten year project here. Gahr and Biddlin like this. The masons were artists in their own rights, and so why do I consider replicating their work somehow more authentic than replacing a wood carving? I don't know either. Weird. You're right that this is a cross over point - but one of the factors that is usually significant seems to be the act of human creativity. To a certain degree, the masons were interpreting an original design created by an architect. By contrast, a painter is both creating an original piece (architect), and using their skills to render the work (mason). So a reproduction of an art work will always lack that first element, which is the element we seem to value. But a reconstructed building still stands as a representation of the original creative act in it's design. Some sense of it's history may be changed for us, but, as long as it's rebuilt on site, there's still a sense that people would've gazed at that 'shape' on this site, over the centuries. Well, it looks like the structure of the stonework has survived intact. The roof and spire are gone, but they are not original. The spire was replaced in the 19th Century, and a lot of the roof is a rebuild. So it looks like this fire will eventually become just another episode in a rich history. GrumpyOldDBA, Gahr and Biddlin like this. Cette Grande Dame de 855 ans est toujours debout. I reckon the restoration will be a lifetime employment. I know the woman who is head of the restoration of Nidarosdomen in Trondheim, Norway's biggest cathedral. She's been working there for around 20 years, and I think she'll still be working there when she retires in 20-25 years' time.